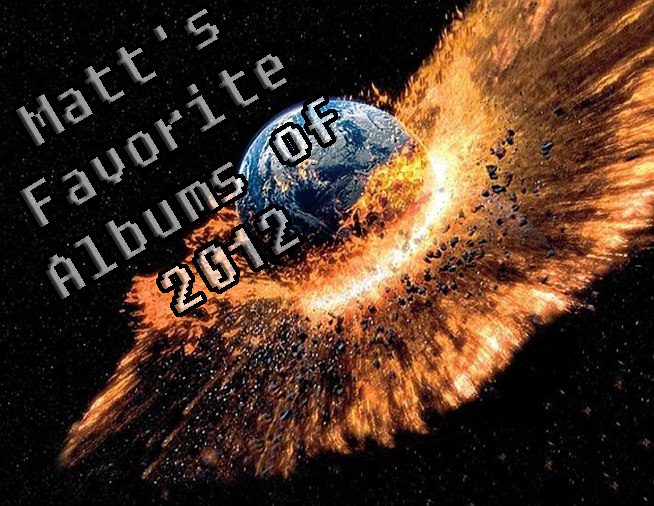 Our favorite music and other things in 2012. Making my Top 15 Albums of 2012 list this year was a bit daunting. There were so many records I heard, and many of the excellent and well deserving of a bit of extra attention. Being as I am, I felt guilty for leaving some of them off, so here I will present, in no particular order other than random, a good handful of albums that came out during 2012 that I enjoyed and feel that you lovely readers should give a listen to. Check ’em out and enjoy!! Peace Love and Metal!!!! I know every year I say that this was one of the best years in metal, but its true, and 2012 was no different. I guess that says a lot about the state of modern heavy metal. The genre has grown into something that was unfathomable at its inception. In no other genre will you find such a diverse set of different acts all boasting such pure passion for what they do. I was also exposed much more music than usual this year since Metal State kinda took off with a spike in readers (thank you!!!) and we started receiving promos from labels and bands looking for exposure (don’t worry, we won’t tell you about the crappy stuff or skew our opinions because a label hooked us up with some free music or a t-shirt). So, when I think about 2012 in metal I can’t help but to return to reflecting on how diverse the genre has become. You will see in my toplist that no single sub-genre really dominates (well I guess you can tell I am a fan a prog metal and was big into the female fronted doom metal bands this year) and there are some amazing albums all across the board in metal this year. There were also a ton I left out which I will post about in the coming days in a quick honorable mentions post. So enough dilly dallying, let’s get it on! Enjoy!! Peace Love and Metal!!! Man, there were a ton of cool videos this year and it seems like the trend of the band recording performance footage in a murky basement while looking tough is being gravitated away from. This year I saw much creativity put into the music video and on a couple of them, it led me to actually go out and buy the album (the others I was going to buy the record anyways). Like Reggie, I’m going to keep the commentary on the video to a minimum and just let the video speak for itself. I hope you enjoy these videos and share with us some of your favorite videos from 2012. Peace Love and Metal!!!!! In case any of you may be curious as to what we enjoy outside the realm of metal we decided to do a list of non-metal things that we highly enjoyed this year, like music other than metal/hard rock, movies, video games. Me and Reggie will both be doing one, so you can get 20 great suggestions of some really neat things. Last year I allowed myself to add things that I discovered that year, but this year I’m limiting myself to stuff released in 2012, with the exception of video games because a lot of 2011 games didn’t get time to get played by me until 2012. Enjoy! Peace Love and Metal!!! I’ve known about this band for a little while now and have enjoyed their unique brand of electronic infused groovy instrumental prog rock, but this year I found myself completely entranced with their latest album simply titled Maserati VII. Each song is just overflowing with great beats (made with real drums) and Chris Farley-sized grooves (played with real bass and guitars). Great music for just chilling out, popping in at a party, or cruising at high speeds in your, ummm, Maserati. This year was a cool year for things non-metal. Overall, I felt it was a bit lacking in the movie department, but I had an opportunity to play some interesting videogames and read a bit more than I have in the past. I will admit I am behind the power curve when it comes to television shows; I discovered some new stuff that interests me greatly. So, I have been catching up. Therefore, not everything I write about on my list was a genuine 2012 release; it’s new to me so we’ll go with that. Here is my top 10 list of things non-metal for 2012. I read this book when it was hardcover years ago and thoroughly enjoyed the statistical aspect of it. As a baseball fan, it was quite intriguing to see the mind of general manager (GM) Billy Beane choose players with the unfortunate aspect of having the lowest budget in baseball, yet still make it to the playoffs. Despite the fact that I am not a data expert, I like the statistics used in this movie to choose the right players; it’s easily understandable even if you are not a baseball fan. Though Brad Pitt himself is not a baseball fan, he did a great job playing the role of the cool GM trying to change the tried and true ways of selecting professional baseball players. This is a new version of the Wii Goldeneye 007 not the original Nintendo 64. However, if you ever played the N64 edition then this is a must have for fans especially if you want to relive those old days of four-person glory. Most of the younger generation CoD players probably have no idea that Goldeneye really opened the door for four-player local action and the inevitable multiplayer online that is so popular today. Overall, the game was quite fun and online play was actually pretty good. There is multiple game options for online play that (I thought) rivaled the big boys…you know what games I am talking about. Insert the new James Bond and you just have a more polished version of an old masterpiece…sorry Pierce. Unfortunately, Michael Crichton’s untimely death left this book unfinished. Insert Richard Preston and the novel is now complete and ready for your reading pleasure. I am a fan of science, therefore a fan of Crichton. Micro takes what would normally be an absurd idea and transforms it into a believable experiment complete with suspense and a satisfying end. Perhaps this is why his books turn into great movies. The premise is that people and objects can be shrunk down to microscopic levels to harvest minerals so small that normal life-size tools cannot extract. Of course there are other uses…weapons, and that is where the story takes a turn. Seven scientists invited to the lab/warehouse find themselves in their new mini forms and on the run not only from the people who want to kill them, but their surroundings that are now so much more dangerous than if they were…normal-sized. When reading the novel, the reader should not be able to tell where Crichton left off and Preston took over. It’s a seamless story in true Crichton fashion. Bruce Willis, time travel, and mobsters; what more can you ask for? The trailer pretty much tells it all. So, without duplicating effort I will just say I thought this movie was fresh. I won’t say it worthy of an Academy Award, but fun to watch and a cool fresh idea. Today’s Hollywood seems to be on track to redo all the older classics – they must be running out of ideas. Looper is a fresh well-done concept full of action and is a nice thrill ride. Personally, I like Brice Willis movies and Looper is another one on his list of cool (not the best) fun to watch movies. I am giving this one more credit for the concept, but it was still a fun movie. I was reluctant to try this game because it’s basically a Grand Theft Auto knock-off. I got tired of that other franchise, but Saint’s Row did a few things to keep it interesting. First, when you do the missions, you do not have to start completely over if your character dies. The game saves periodically giving the player an opportunity to play through missions faster than if having to start the task completely over. Second, the map shows the player where all of the missions are if you discover them. You do that by driving near an area…then a job gets highlighted on the map. This forces you to explore the map. The player can choose what to do when they feel like it. Third, the game is open world and the bottom line with that means the player can play through the mission in about 30 hours or play for a hundred hours doing everything else. I would love to have a more metal soundtrack, but besides that the game was fun, easy to get used to, and not terribly frustrating to play. Some friends of mine spoke volumes about this show, but I never followed up. Then I saw the show’s star Bryan Cranston on a talk show which also featured a video clip. That was all it took to sell me. I am through season 1 & 2 and have 3 & 4 waiting in the wings. The basic story is that Mr. White (Cranston) is a science/chemistry teacher diagnosed with cancer. Skip a few story items and he ends up cooking meth to make money to leave to his family when he dies – very noble I guess. The story is simple, but his meth making partner Jesse (Aaron Paul) is an addict and White’s brother-in-law is a cop. His wife is pregnant (in season 2) and well you take it from there…lots of lies, cover-ups, crazy drug dealers, and money. As of now, Mr. White makes the best, purest meth ever heard of and the story unfolds every episode. I think they are up through season five…so I have much to look forward to in the coming weeks. I don’t think I have ever played a game that captured the feel of the period more than L.A. Noire. You get to put on your detective hat and put away criminals. You work your way up the ladder from beat cop to detective. One huge element of the game is your interrogation techniques (not shown in the video). Once you make an arrest you are presented with a set of questions in which you need to make the right choices. Make good choices and your perpetrators go to jail. Make bad choices and they walk. The story unfolds through three CDs…so, you will definitely get your return on investment. Because this game is a bit old now, it’s likely you will find in a bargain bin or used for quite a low price. In which case, I say jump on it! I have read a handful of King novels in my life. Next to The Shining, this is my favorite King book. I like his ability to make something out time travel. As he mentions in his video, it’s hard to make time travel believable and acceptable. In this story it works. I also like the fact that you have fiction intertwined with a real event. What would you do if you could stop a major event like the JFK assassination? Would you do it? Do you think the world would be a better place? It’s going to take 700-800 pages for you to find out in 11/22/63. For me, it was hard to put this novel down and I recently read there would be a movie in the future. I hope it does the book justice. For now, check out the book, it’s a great read. I am going to cheat on this one a little bit and use it as a two-part entry. I read the novel after seeing the series on television. The show is amazing and so is the first book A Game of Thrones. Season I and 2 have already been aired and I am unsure of whether or not I will continue reading the story. Based on my wife’s experience with the first four books and what I have seen through interviews, the television series starts to stray from the original storyline. Therefore, I may skip book 2 and jump to 3 before the season starts in April 2013 so I can see the differences. Despite the possible disparity between novel and screen, I love the first book and both television seasons. When the show comes on, things come to screeching halt in this household. Unlike Game of Thrones, I am on my own with this one. My wife isn’t into the gory/scary stuff much. This has to be the coolest edge of your seat show and my personal favorite this year. Though season 7 is airing or has finished airing recently, I have not seen it; I do not subscribe to Showtime. I have to wait until it gets released on DVD or for digital download. I have only seen up to season 6 of which I think I eagerly watched all of them this year. Dexter is a blood spatter analyst with the Miami police department. He is also a serial killer. His father (before he died) was a cop and his sister is now a detective. Dexter uses some creativity to cover his tracks. It’s a great show because it puts the viewer in favor of the murderer – the vigilante. After all, his victims are the dregs of society. You can’t help but feel for Dexter. In the video below, the guy in the pink shirt with the long knife is Colin Hanks. Each season, there is a cool guest star at least up to what I have seen so far. I have to throw in a bonus this year. I just realized I also caught up with The Walking Dead. Like most television shows I missed season 3 so I will have to wait until it is released for sale. This show is more than just a zombie story; it is about survival. There is also a videogame about the series for which I have heard outstanding reviews about. I think I am going to make that game a priority right after the holidays. My mind hasn’t changed much since last year. I still have some favorite shows that didn’t make the list this year simply because I didn’t want my Top 10 Non-Metal things to be a mirror image of last year. I am still very much a fan of The Big Bang Theory and Modern Family. I also played MLB 2K12 like I do every year and had a good time modeling a player after me and making him a star. I also enjoyed the movies Prometheus, Tower Heist, Midnight in Paris, The Ides of March, and especially Argo…all worth checking out. Midnight in Paris is great if you want to watch a neat movie with a special someone like I did with my wife. I hope you enjoyed my list of things other than metal. As you can see I do have other interests. Have a great year in 2013. I look forward to some great metal…and other things.